A shifting tide in post-secondary education has led to professors transferring more classroom lessons into real world settings. Professor Fowlkes, a business professor at Emory and Henry College, currently teaches an Operations Management class that requires teams of students to visit and interview a for-profit and non-profit company. Through each interview, students must evaluate processes, business models, management, work roles, quality, and outcomes associated with each company. The interviewers also prepare class presentations and papers summarizing their findings. 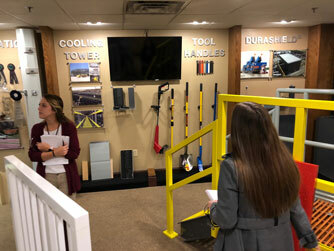 Senior business majors, Kailtyn Sheaves and Brice Quillen, visited and toured Strongwell and Highlands Community Services this year to fulfill the class requirement. Their main questions focused on how Strongwell remains as a top leader through trade policies, material offerings, technologies, limitations, branding, engagement, and manufacturing. Afterwards, representatives from Strongwell, SESCO, First Bank and Trust, State Street United Methodist Church, United Way of Southwest Virginia, and Highlands Community Services, were invited to the class to speak about their roles in the community and how employment and concept of work have changed. The question and answer portion targeted the concerns and misconceptions from students regarding career and economic development within Southwest Virginia and Northeast Tennessee. Many thanks to Professor Fowlkes and his class for showing an interest in the diverse economic sectors which makeup SWVA and NETN.